Today, we’re all about monograms. 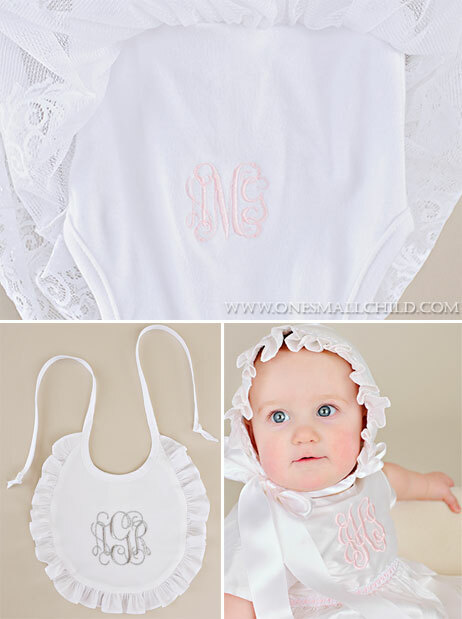 We love offering monograms on our baby clothes and gifts. 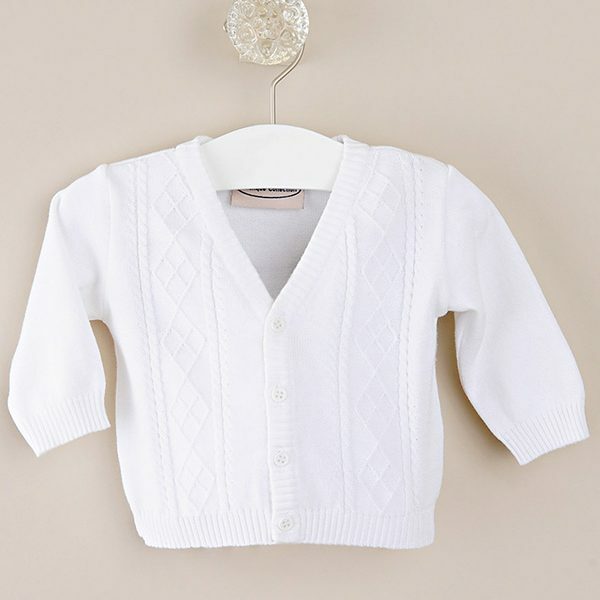 What a wonderful way to add a personal touch to your little one’s special outfit! A gift becomes so much more when embroidered with her name or initials. “An individual’s monogram is often a very fancy piece of art used for stationery, for adorning luggage, for embroidery on clothing, and so forth. These monograms may have two or three letters. 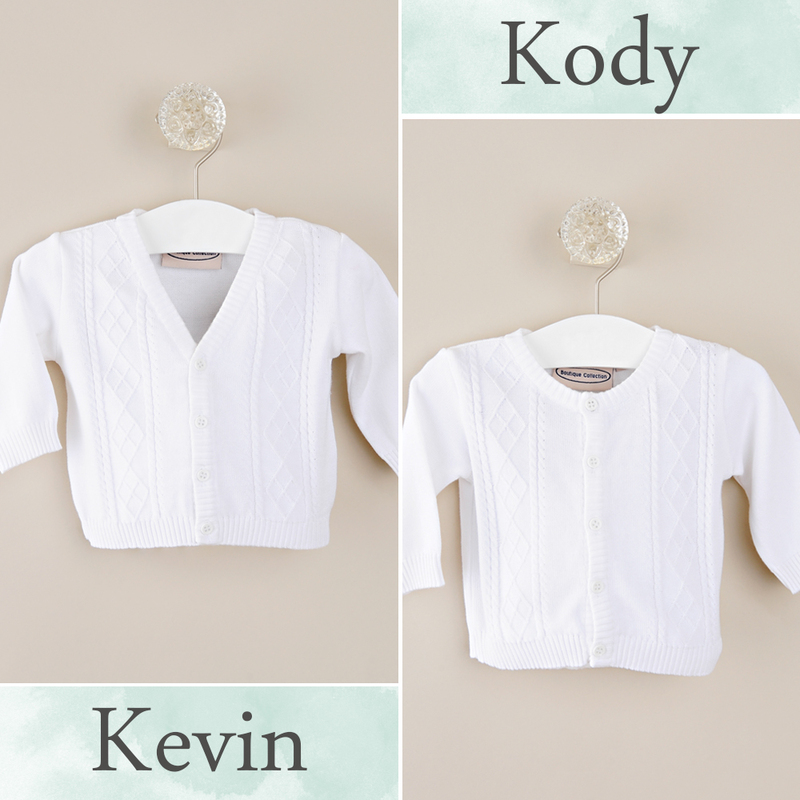 At One Small Child, we offer monograms, initials, names and dates on so many of our clothes and gifts. Just look for the words “Can Be Personalized” under the product image. There are a variety of embroidery or engraving options for these items. Simply click into the product page and look for the Personalize Options box to view the options for that specific item. When you click on the Personalize button, all the information you need will pop up, including embroidery placement images, thread color photos and text boxes to enter in your information. So easy! Looking for something fabulous for your Little Boy Blue’s spring celebration? 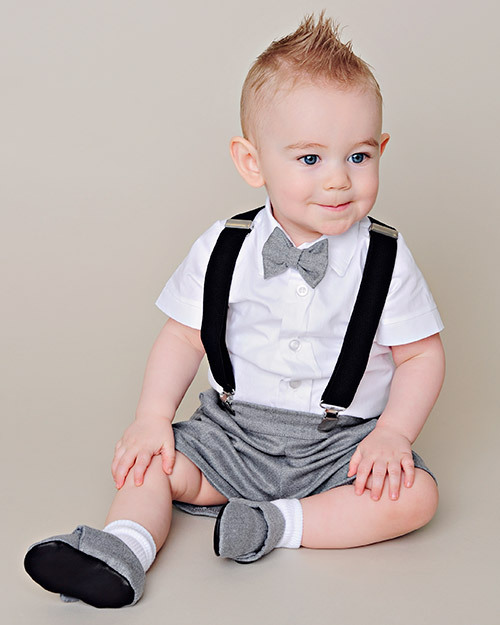 We love the Noah outfit for Easter, his first birthday, a spring Christening or wedding. …Oh the possibilities. Our Noah Blue Christening Outfit is an adorable one-piece short-all. 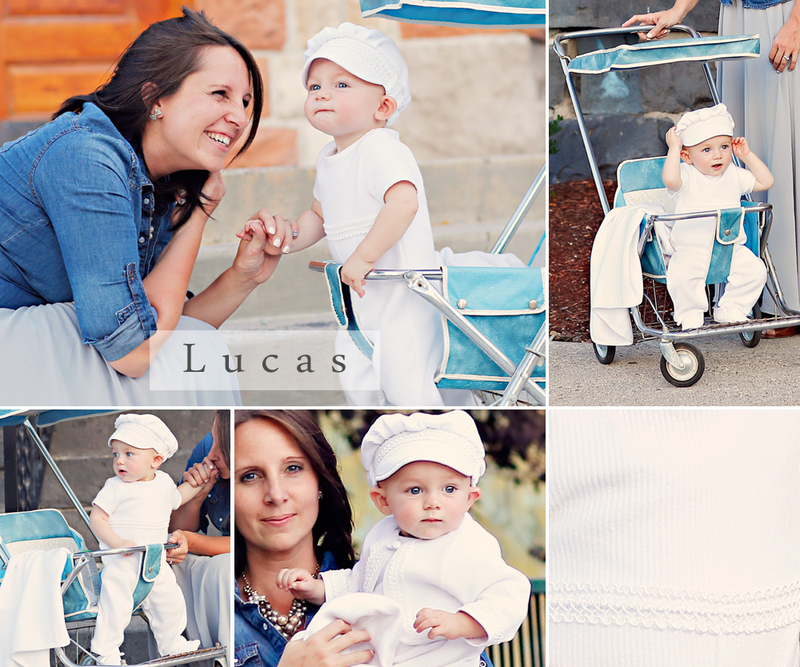 Made from blue silk, this outfit is lightweight and comfortable for baby. Not to mention, so luxurious! The simple style features cuffed sleeves and legs. Silk-covered buttons accent each cuff. The pleated front lends to the menswear-inspired design. 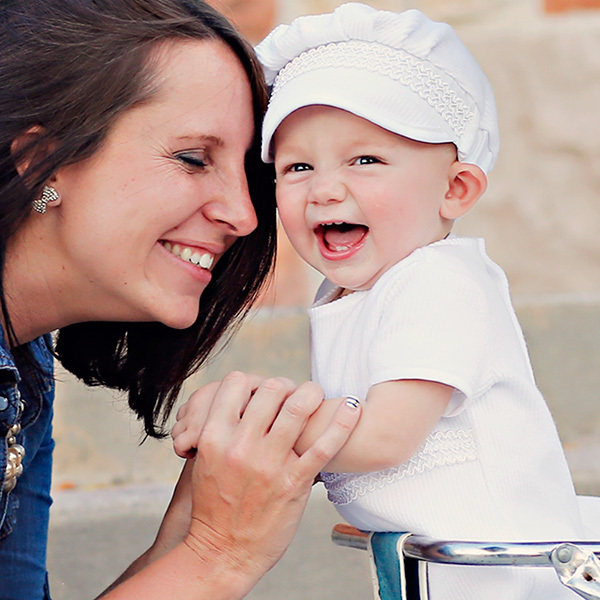 Your little man’s look is topped off with an adorable beret hat. 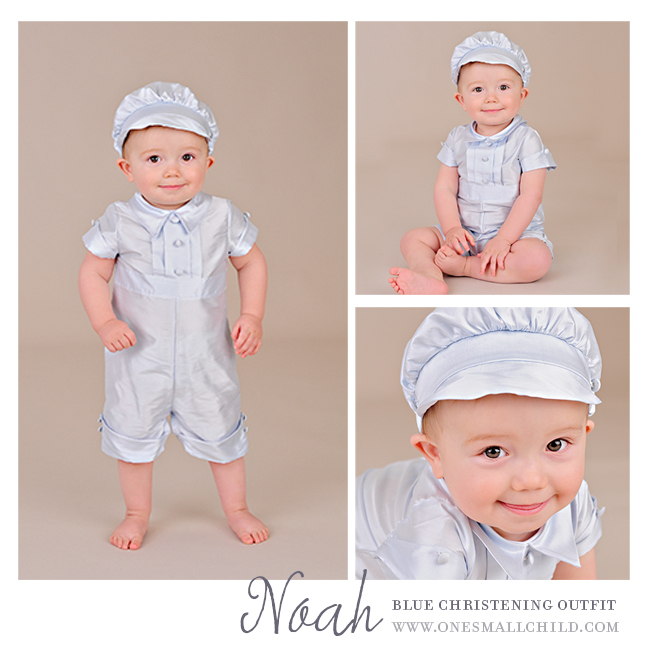 Noah blue christening outfits are available here in sizes Newborn through 24 months. Just in time for your Easter celebrations! Going grand for your precious little one’s big event? 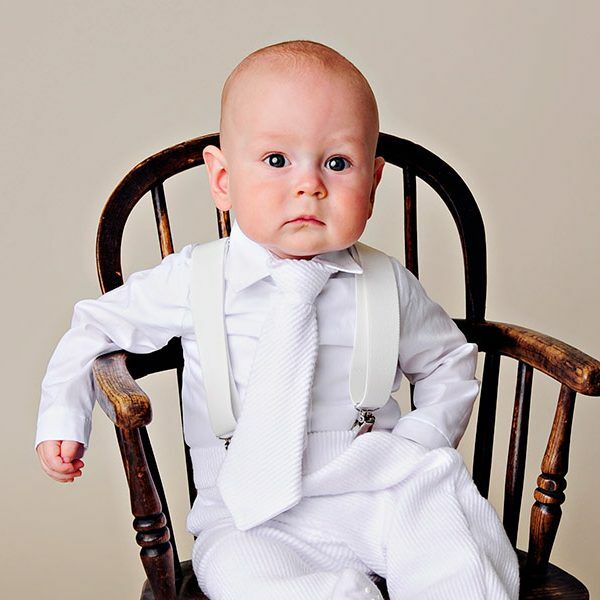 We’ve got the ultimate christening outfits! These lavish looks make a statement. They’re the complete collection for baby’s religious debut! The Francis collection was named after the current pope: Pope Francis I. 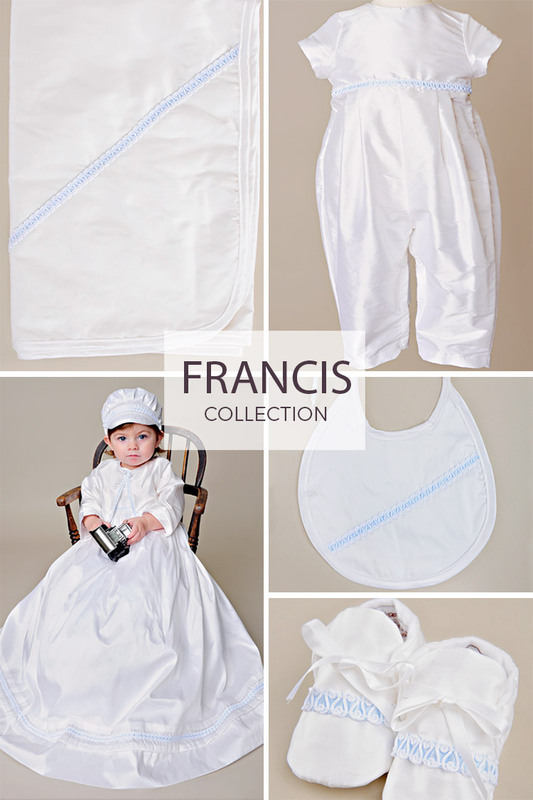 The Francis is a simple, modern Christening outfit. 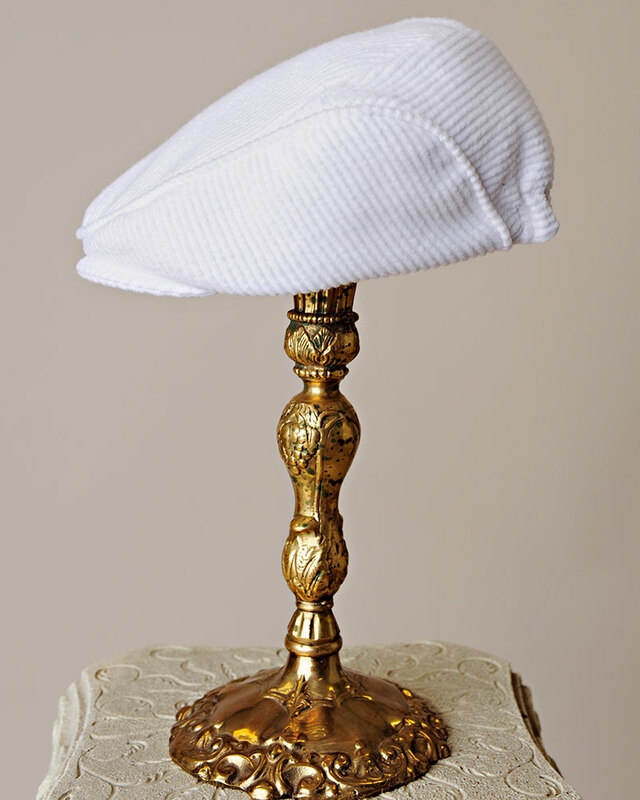 The newsboy hat and regal length add subtle traditional touches. Each item is hand-crafted with fine dupioni silk. A touch of blue gives a masculine essence to each piece. The collection includes: baptism gown, after-Christening romper, jacket (not pictured), blanket, bib and shoes. Our Phoebe was designed to be the counter-part to the Francis. It co-ordinates flawlessly! The Phoebe features the same modern design as the Francis, with a few feminine additions. We added a lovely monogram to the gown and lush silk ruffles to the blanket and bib. 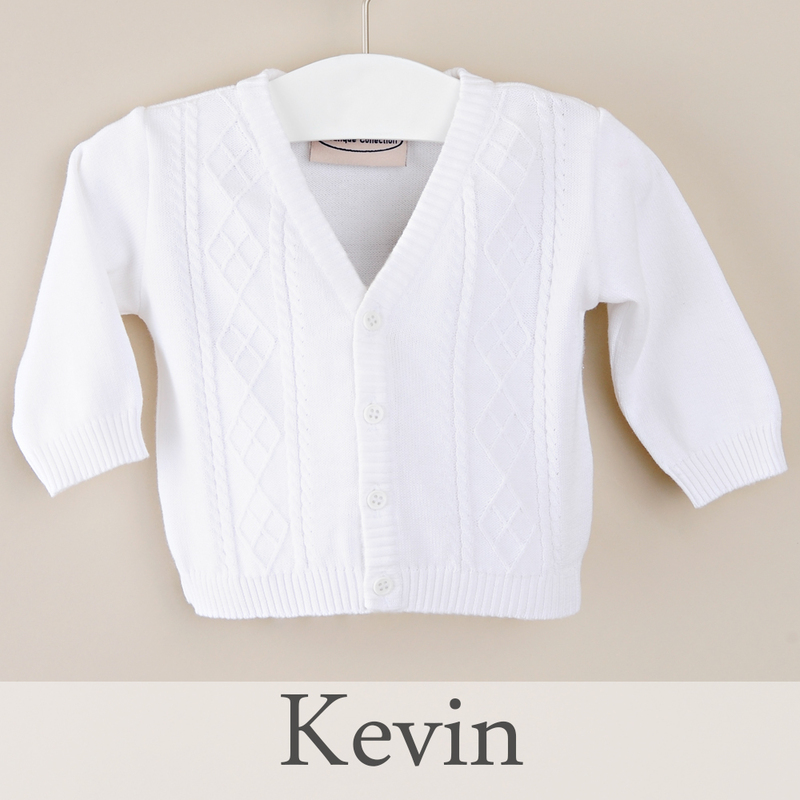 The collection includes: baptism gown, after-Christening romper, jacket, bib, blanket and shoes. 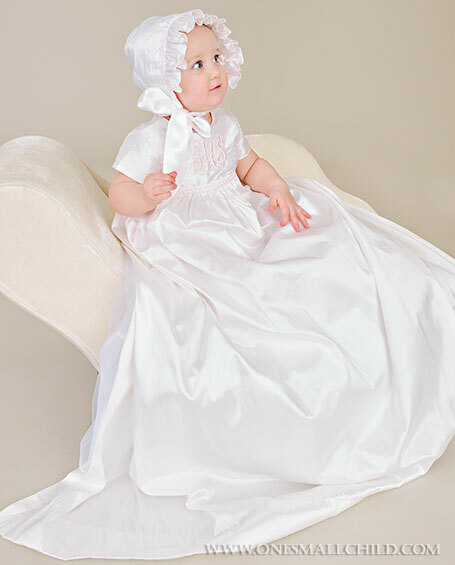 Our Christening accessory sets are the perfect finishing touches to the ultimate Christening outfits. 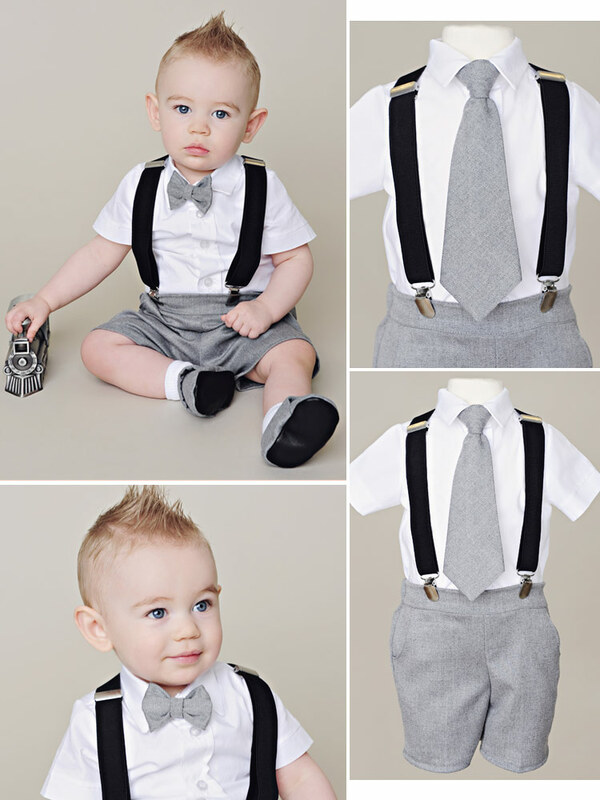 Everything baby will need for his big event is decorated with simple detailing. Choose from our girl or boy sets. 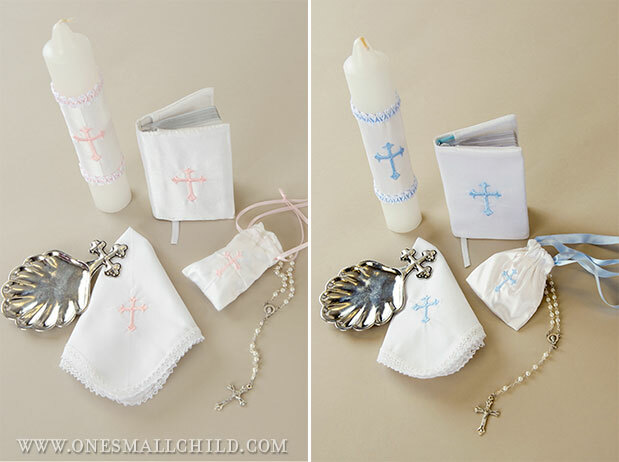 Each includes: a candle, shell, hankie, rosary, silk rosary bag, mini New Testament, and personalized muslin tote (not pictured). The grand opening of our new baby boutique was a huge success! We couldn’t be happier, now that our doors are officially open! Thanks to all of you for stopping by! Today, we’d like to highlight your favorite products. With all the amazing items, it was hard to choose! We finally narrowed it down to two items: The Aiden and the Alex. These were the most popular outfits in the baby boutique. Check them out for yourself and see why they’re your favorite products! Our Aiden is a warm and comfy knit romper. This classic boy’s outfit never goes out of style! The Alex is an adorable vested romper with a newsboy hat. This simple cotton outfit is perfect for spring and summer! Complete our Alex outfit with our Waffle Textured Socks, and our Waffle Pique Blanket. Didn’t make the grand opening? We missed you! Come see us Wednesday evenings from 4:00-7:00 pm and Saturdays from 10:00 am-2:00 pm. 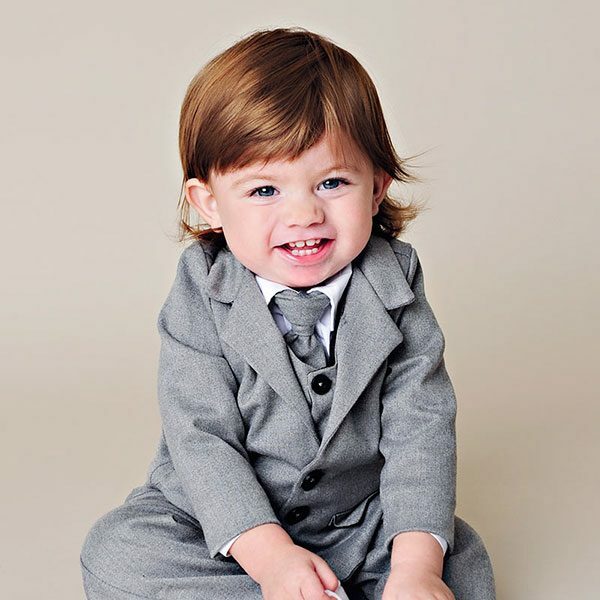 We want to share one of our favorite winter Christening outfits today. The Lucas is an adorable 3 piece set. 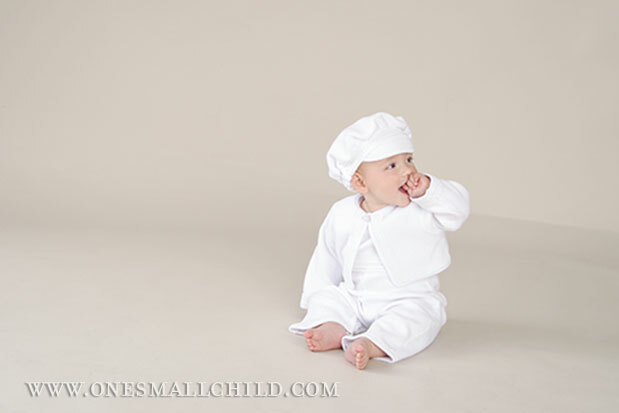 It includes a short-sleeved romper, adorable jacket and a visor beret hat. Each is made from plush knit cotton. This ribbed material has a heavenly texture. It’s extremely soft and thick. 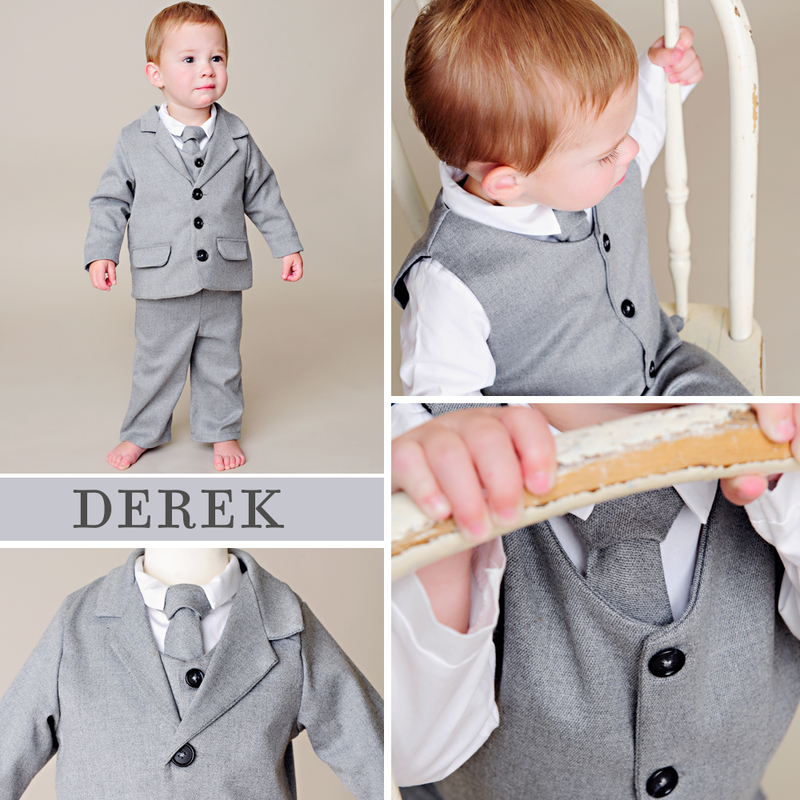 Your little gentleman will stay warm and snug in this handsome outfit! Ornate braided trim adds a subtle touch to the romper, jacket and hat. Complete his look with our signature sleeveless bodysuit, matching Lucas shoes and Lucas blanket. 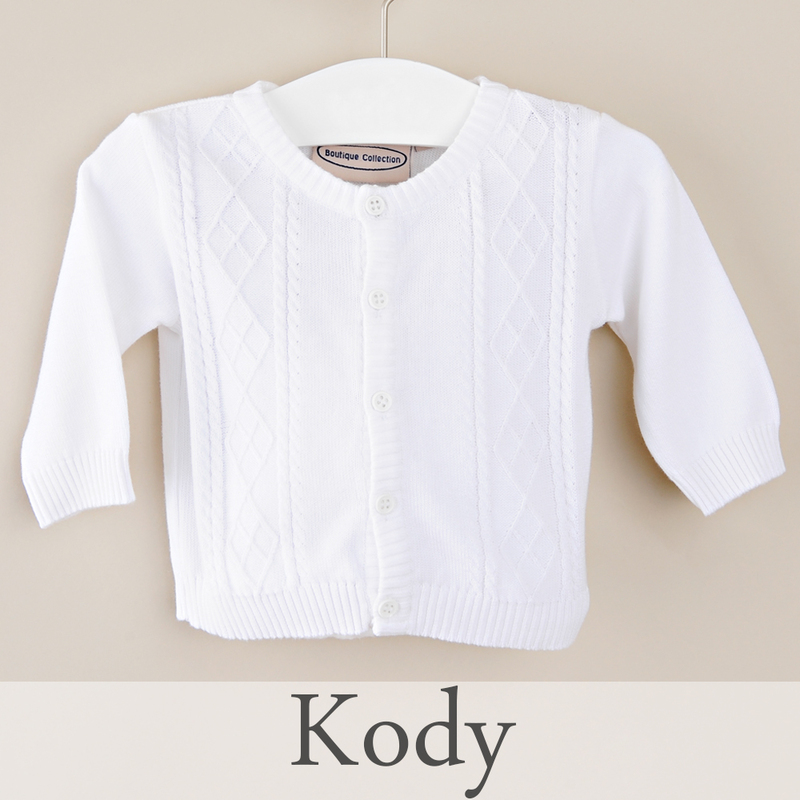 Looking for more winter Christening outfits? Check out our complete selection here!